The most important step in the mail merge process is to set up and prepare your data. You'll use your Excel spreadsheet as the data source for the recipient list. Column names in your spreadsheet match the field names you want to insert in your mail merge. For example, to address readers by their first name in your document, you'll need separate columns for first and last names. Data entries with percentages, currencies, and postal codes are correctly formatted in the spreadsheet so that Word can properly read their values. The Excel spreadsheet to be used in the mail merge is stored on your local machine. Changes or additions to your spreadsheet are completed before it's connected to your mail merge document in Word. You can import information from your Excel spreadsheet by importing information from a comma-separated value (.csv) or a text (.txt) file and use the Text Import Wizard to build a new spreadsheet. For more information, see Prepare your Excel data source for mail merge in Word. Browse to your Excel spreadsheet, and then choose Open. If Word prompts you, choose Sheet1$ > OK.
You can limit who receives your mail. 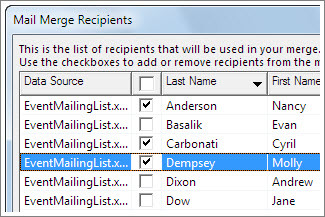 In the Mail Merge Recipients dialog box, clear the check box next to the name of any person who you don't want to receive your mailing. Note: You also can sort or filter the list to make it easier to find names and addresses. For more information about sorting and filtering items, see Sort and filter the data for a mail merge. On the Mailings tab, in the Write & Insert Fields group, choose Greeting Line. Under Greeting line format, change the salutation if necessary by choosing the greeting (Dear is the default), the format for the recipient name, and the ending punctuation (a comma is the default). 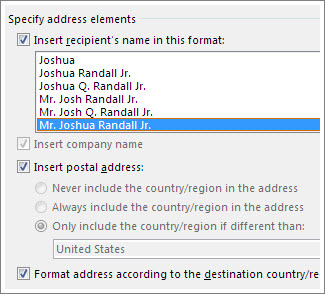 Under Greeting line for invalid recipient names, choose an option in the salutation list. 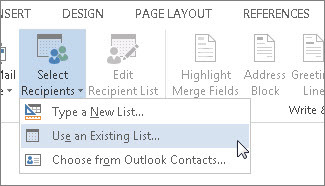 On the Mailings tab, in the Write & Insert Fields group, choose Insert Merge Field. In the Insert Merge Field dialog box, under Fields, choose a field name (column name in your spreadsheet), and then choose Insert. Repeat step 2 as needed, and choose Close when done. 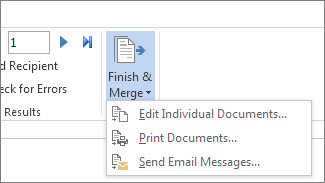 For more information about adding fields from your spreadsheet to the merge document, see Insert mail merge fields. And if you're interested in learning more about options for setting up email message, see Email merge in Word. After you insert the merge fields you want, preview the results to confirm that the content is okay. and then you're ready to complete the merge process. Choose the Next or Previous record button to move through records in your data source and view how the records will appear in the document. When you save the mail merge document, it stays connected to your data source. 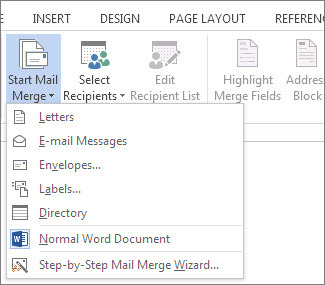 You can reuse the mail merge document for your next bulk mailing.